What Can Rocks Teach Us About Life? Everyone in the class said, “Yes.” Then he said, “Really?” He reached under the table and pulled out a bucket of gravel. Then he dumped some gravel in and shook the jar causing pieces of gravel to work themselves down into the space between the big rocks. “No,” the speaker replied, “That’s not the point. The truth this illustration teaches us is: If you don’t put the big rocks in first, you’ll never get them in at all.” What are the ‘big rocks’ in your life? Your children; Your loved ones; Your education; Your dreams; A worthy cause; Teaching or mentoring others; Doing things that you love; Time for yourself; Your health; Your significant other? Remember to put these BIG ROCKS in first or you’ll never get them in at all. If you sweat the little stuff (the gravel, the sand) then you’ll fill your life with little things you worry about that don’t really matter, and you’ll never have the real quality time you need to spend on the big, important stuff (the big rocks). What are the ‘big rocks’ in my life? Start asking yourself that question to simplify your life. Always remember to put the big rocks in the jar first. Change is in the air. Kids Yoga at the YMCA exploded last week - nearly tripling our class size to 21 kids. The energy in the room was amazing and got most of the kids super focused on the task at hand, yoga. The ages ranged from 3 - 9 years old and (I think) mostly everyone was engaged at some level. This Tuesday's class we'll celebrate the shift in our class by honoring the "change" and bringing awareness to how it affects our lives. The theme will be relevant to both new and old students in different ways. The older students may not have felt positive about the expansion of the class, there was less attention provided to each individual student and the class dynamic shifted quickly without warning. The new students may be encountering yoga for the first time and instantly have a judgment of yoga or of the class (the teacher, the kids, the exercises). By focusing the class on change upfront, I hope to bring awareness to the concept. Perhaps the kids will learn throughout the class how to be "non-reactive" to the constant ebb and flow around them. Perhaps they will learn to notice the sensations that change incites on their bodies and minds - and then learn to let them go. Balancing Flower Series in a circle (practicing warrior II with fingers touching, reversing the warrior, triangle to balancing half moon holding hands in a circle! Fun with Family Yoga Starts Friday January 7th! Another free-for-YMCA members or $10 drop-in class perfect for the winter months when you and your kids are crawling up the walls! Come bond with your child through Yoga! Perfect for parents with children crawling to 3 years (although any age welcome), this engaging class will incorporate yoga poses with movement, music and song. And why not take advantage of our Prime Time room and sign up for Yoga Fundamentals on Fridays at 9:15 AM for some adult time as well? Did you know that you DON'T have to be a member of the YMCA to take a group class? Kid's Yoga (ages 5 years +) starts tomorrow for only $10 / class. And always free for members. Kids yoga is proven to increase mobility, strength & attention span by learning to follow instructions developed specifically for their unique curiosities and abundant energy! Kids Yoga is perfect for after YMCA swim team or to wind down a busy day, your child will enjoy kid-friendly yoga poses in a fun & light-hearted class. Younger kids welcome with an adult. Parent Tip: What's great about the YMCA is that if you're a Family member and you have other children not ready for yoga (as I do) you can drop them off in the Primetime room giving yourself some much-needed adult time (stair machine anyone?). 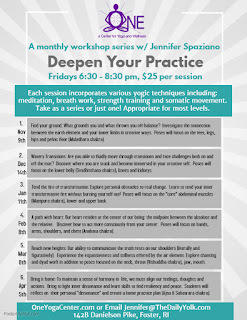 Yoga Fundamentals Series Starts January 14th! Whether you’re brand new or a seasoned yogini, this course will provide you with a solid foundation for your home yoga practice. Each week we will focus on specific yoga philosophies, poses, breathing and meditation techniques. register at the Welcome Center TODAY!